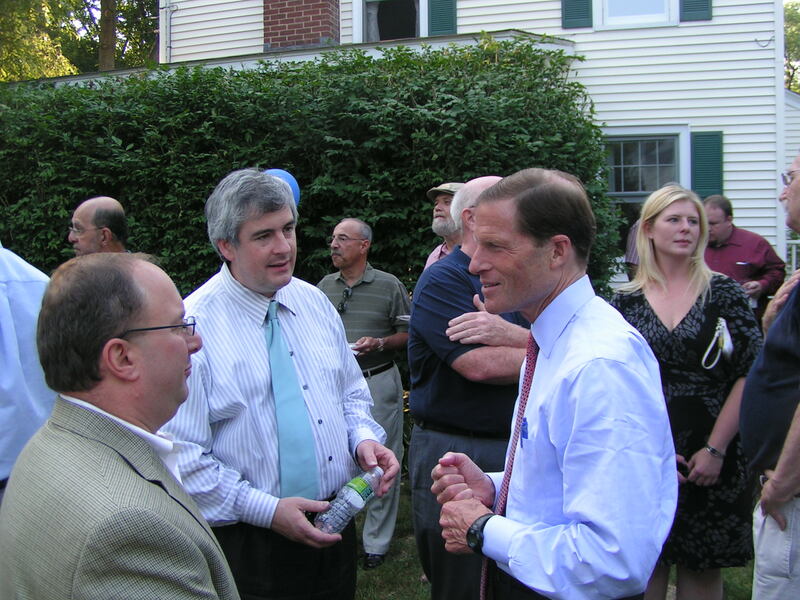 Berlin and New Britain supporters of Attorney General Richard Blumenthal held a fund-raising reception for his U.S. Senate candidacy on June 18th. The event was held at the home of DTC member David DeFronzo and former DTC officer Monica Hermanowski DeFronzo. State Rep. John Geragosian (left) and State Rep. Tim O'Brien greet Attorney General Richard Blumenthal at a neighborhood reception for Blumenthal's Senate campaign on June 18th. “Lives have been lost and ruined by this disaster. The environmental and economic impact will be felt for years. Irreparable damage has been done. BP must be held accountable and the independent committee reviewing this disaster must have the tools it needs to do the job,” said Blumenthal, Connecticut’s Democratic candidate for the U.S. Senate. “We must get serious about protecting people instead of the profits of big oil.” Other steps urged by Blumenthal include an increase in the liability cap on Big Oil companies, an immediate and indefinite moratorium on new offshore deep water drilling and closing the tax loopholes for oil companies seeking new leases on public lands..
Blumenthal said more accountability from Big Oil and more protections for consumers and the environment are needed in the wake of the explosion on BP’s oil rig in the Gulf of Mexico, which continues to endanger the economic livelihood of millions and devastate the coastline. This entry was posted in Blumenthal. Bookmark the permalink.